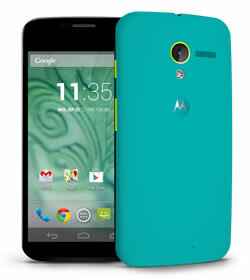 Key difference: In May 2013, Motorola - a Google Company announced the launch of its flagship phone, the Moto X. The phone was officially available on August 23, 2013. Samsung Galaxy S4 is the flagship phone of the Samsung Corporation. The Personal Communication Sector (PCS), essentially Motorola's cellular phone division, was acquired by Google on August 15, 2011. It was previously called Motorola Mobility LLC, however it is now known as Motorola - a Google Company. In May 2013, Motorola - a Google Company announced the launch of its flagship phone, the Moto X. The phone was officially available on August 23, 2013. Motorola marketed the phone as the first Motorola smartphone to be created and assembled in the United States. Additionally, the phone is highly modifiable. While, the front panel of the phone is available in black or white, the back panel is customization in up to 18 colors. However, this option is only available in the United States and exclusively to AT&T customers. The option may be expanded to other customers after November 2013, but that remains to be seen. Currently, other customers only have the option of woven black and woven white. In terms of hardware, the phone features a 4.7 inch AMOLED display with a resolution of 1280 x 720 pixels. Moto X is powered by the Motorola X8 Mobile Computing System which consists of a Qualcomm Snapdragon S4 Pro System-on-chip, a single-core Natural Language Processor and a single-core Contextual Awareness Processor. The Snapdragon SoC itself consists of a dual-core Krait 300 CPU at 1.7Ghz and a quad-core Adreno 320 GPU at 400 MHz. Moreover, the device has been touted as having Contextual awareness, which includes features such as saying "OK Google Now" to activate Google Now hands-free; activating the camera with flicks of one's wrist, known as 'quick capture'; the clock is displayed automatically when the phone is picked up or taken out of the pocket; the screen regularly turns on for few seconds and shows the time and recent notifications; notifications appear when a finger is placed on the screen and removing the finger returns the phone to the lock screen. 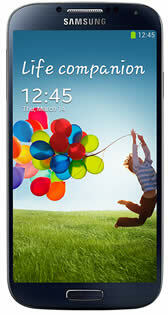 Samsung Galaxy S4 is the flagship phone of the Samsung Corporation. It was the much awaited successor to the very popular Samsung Galaxy S3. The phone new features into a slightly smaller and sleeker design. The phone’s screen has been increased to a stunning almost 5 inches with only slight decrease in size of the phone. The screen is a full HD Super AMOLED capacitive touchscreen that provides a greater resolution of 1080 pixels, almost 441ppi density. The phone is available with either the 1.6 GHz octa-core Samsung Exynos 5 processor or the 1.9 GHz Snapdragon Fusion Pro quad-core processor, depending on the market. It is available with 16/32/64 GB internal capacity options and if that is not enough it can be upgraded by another 64 GB using the SD slot. The S4 comes with 2 GB RAM, which has become a norm for smartphones these days. The phone was launched with some new features such as Air Wave, Smart Scroll and Smart Pause, as well as Group Play and Dual camera mode. The information for the detailed table about the two phones has been taken from the Motorola website, the Samsung website and GSMArena.com.